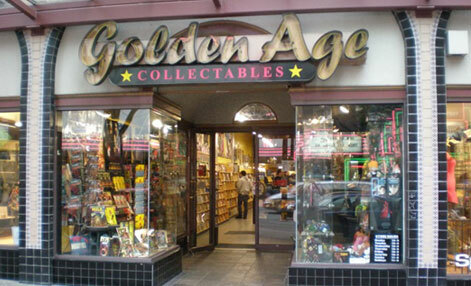 Golden Age Collectables is a long time retail store in Vancouver, BC, and winner of the 2000 Will Eisner Spirit of Retailing award. From the Golden Age of Comics plus, at the time, we wanted to be more inclusive. How many sq ft is your store? Re-design the windows for displays. I have been on the same block for 30 years: fans, friends, collectors and readers all know where to find me. This is rewarding in a personal and, of course, financial way. I am hard wired for this: I started collecting comics at age 10 (1966). I bought and sold comics to expand my collection, opened a store shortly after leaving high school (1974) and haven’t looked back since. Almost everything we sell is genre themed. It is our most important advertising and location tool, however we are a pure retailer and don’t focus on mail order. Others do mail order bigger and better, so I try to be the best retailer I can. Each senior employee has an area of expertise: Mike – Gaming; Misty – Manga; Nicholas – Toys; Hank – Graphic Novels; and I myself am a longtime collector/dealer in Gold and Silver age Comics and carry a large selection of old comics. We are very self-confident in these areas and that may be unique! Local artists, typically from one of the film or art schools publish one-shots. There is a large anime convention and one long-time, ongoing, small convention that brings in excellent guests. There are also several first rate professionals in Vancouver: Kaare Andrews, Pia Guerra, Steve Sadowsky, Ian Boothby, William and Noel Van Horne, Camilla d’Errico, and a few I’m sure that I am forgetting. Every Year, it’s turned into the busiest day in the first half of the year. Having a large, complete inventory on hand so that people don’t have to special order things or walk out without a sale. Do you have special event nights/days at the store? Movie Tie-In with tickets, promotional items. Movie Tie-In’s with tickets, promotional items. Yes. Most commonly it brings old readers back into the fold, and more recently newer readers. With the increasing popularity of GN’s/TPB’s do you find yourself stocking these more or less than you expected. There are a lot of upfront cost in a large TPB inventory, are you focusing on a publisher or specific series? Do you intend to carry a wider range of publisher in the future or would these books be special orders only? We carry more graphic novels all the time. I believe it’s amateur (for a retailer) to not look for anything that may sell, regardless of the publisher or (the retailers) opinion and your shelf life on graphic novels is huge compared to a monthly comic, with similar margins. There is huge upside for books like Scott Pilrim, Johnny The Homicidal Manica, Tank Girl, or Wet Moon. Are you located near any schools? Is there a college nearby? What percentage of your business would be students? Did the presence or lack of presence influence your decision to open at your current location? There are no grade schools nearby. The UBC downtown campus is one block away. SFU downtown campus is 4 blocks away. Vancouver Film school is 6 blocks away. There is an ESL school on our block and many, many more ELS schools in the downtown area. None of these schools existed downtown when I opened so they of course they wouldn’t have influenced my location decision. Do you consider your store woman and kid friendly? What percentage of your business is female/child? Women 20-25% and kids 1-2%. Do you have plans to grow these groups? Do you have a kids comics section? Do you stock comics that are considered kids friendly/age appropriate reading? It is worth noting that most of the kids comics sell to adults that enjoy the kids characters (especially Archie), only the youngest (8 and under) want kids comics. The older kids want the other ‘cool’ comics. It is also worth mentioning that I believe that if you want a store to be women friendly, hire a knowledgeable women to work for you, it breaks up the frat club atmosphere that can develop when men work together and creates an all-around more professional atmosphere for you to present to a significant part of your customer base. 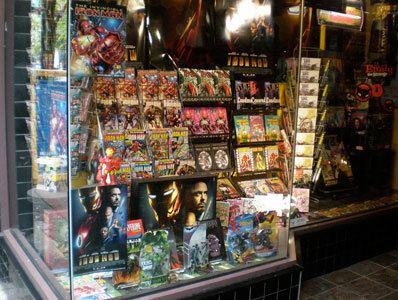 Do you consider your store a collector store, where you can find high grade books, or long runs of older back issues? Do you find that back issues are a focus for your customers? Yes! Back issues are becoming less important as graphic novels take over but classic old comics have never been better. Pull lists: good or bad? Do you have free pull list? Minimum number of titles? Do you offer a discount on everything for a pull list customer? Do you have them pay a yearly membership fee to get a discount? I don’t see how you can avoid pull lists, we don’t charge for it but I admire dealer who can successfully do that. I ask for a three comics a month, but don’t enforce it very strongly. I have always believed that across the board discounts are a mistake: it’s fine to have a sale but target your items. Do you use a computerized point of sale and inventory system? Do you track sales of items to adjust orders up or down? Do you have a system to ensure a restocking of a sold book?